Farming communities in the semi-arid tropical regions of Africa are becoming particularly vulnerable and face enormous challenges for their survival. Climate change, diminishing and unreliable rainfall, traditional mono culture cropping farming practices, high population growth, frequent famines and high de-forestation rates have led to severe environmental degradation and impoverished soils. This has resulted in poor crop yields, high malnutrition rates and extreme poverty. In this article, I would like to present an integrated farming system developed in the Maradi region of Niger, which has a semi-arid environment with 450 mm annual rainfall and a growing season from June to September. This farming system is showing promise for overcoming the main limitations to farming in the semi-arid tropics, and has potential for replication in other semi-arid regions of the World. FMNR is a simple re-forestation technique developed by SIM in the early 1980’s. The regenerating stems of underground tree stumps are pruned and a limited number allowed to grow into multi-stemmed trees. The only input is the farmer’s labor, and the farmers themselves decide on the number of trees/stems per field. In just over 20 years of using this technique, 50% of Niger’s once treeless farmland has experienced reforestation rates unprecedented elsewhere in Africa. This represents one of the great success stories in the field of climate change and agriculture and is perhaps the single largest environmental transformation in Africa. FMNR directly leads to increased food security, income generation, biodiversity, environmental restoration, enhanced soil fertility and decreased soil erosion. In the Maradi area alone, a conservative estimate of total additional income attributable to FMNR is $US 17-23 million per annum. There are now between 5-6 million hectares of FMNR in Niger alone, and the technique is spreading rapidly to other African countries through the Africa ReGreening Initiative. This initiative commenced in 2007 by a loose coalition of NGOs with the objective of kick starting an Africa wide reforestation movement mainly through the practice of FMNR. CRM (Crop Residue Mulching) involves cutting the annual crop residues after harvest and laying this material on the soil surface. Ground cover is increased, and soil organic matter and soil fertility are improved as termites cycle the nutrients. CRM also reduces evaporation while enhancing water infiltration. Multi-purpose edible Australian acacias (Acacia colei, A. torulosa, A.tumida, A. elacantha) thrive under Africa’s semi-arid conditions. Domestication and evaluation programs over the last 20 years have led to a broad range of types with wide adaptability; high growth rates, seed and wood yield. The seeds are of high nutritional value and have long-term seed storage capacity. Other valuable Agro-forestry trees such as the pomme du Sahel (Ziziphus mauritania), tamarind (Tamarindus indica), boabab (Adansonia digitata) and moringa (Moringa oleifera, M. stenapetala) which have edible fruits and leaves, can be planted to complement FMNR and the acacias. Annual/perennial cash crops such as millet (Pennisetum glaucum), sorghum (Sorghum bicolor), cowpeas (Vigna vaguiculata), peanuts (Arachis hypogaea), hibiscus (Hibiscus sabdariffa), sesame (Sesamum indicum), and cassava (Manihot esculenta) are then planted in annual rotations between the tree rows. A typical FMAFS farm layout incorporates FMNR as the basic starting point. Australian acacia trees are the main exotic tree planted on the farm borders and in rows within the farm. A one-hectare model is given in Figure 2. The acacia trees are pruned every second year and produce edible seed every year from the second year after planting. Annual crops are planted in rotation between the rows of trees. Farmers determine the density and layout of exotic tree plantings, the types and numbers of indigenous trees and which annual crops they will plant. Figure 2. The FMAFS, one hectare model. Trees on the boundary are spaced 5m apart. Trees inside the borders are planted 10m apart in rows with 25m between rows. The rows of trees are oriented across the prevailing wind direction. Total number of acacia trees = 107 per ha. Shaded area: FMNR with 40 to 120 trees per ha and annual/perennial crops in rotation. 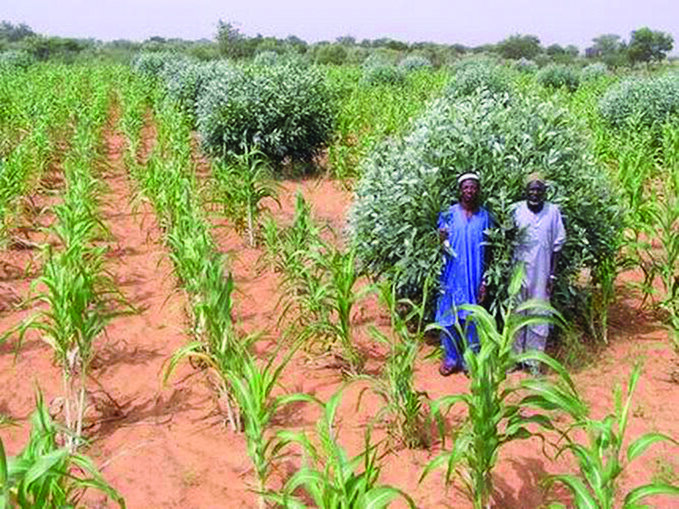 The first FMAFS plots were established in 2005 as one hectare model farms at two research and demonstration sites near Maradi (Maza Tsaye and Danja). Currently, there are 642 FMAFS in 27 villages, which directly benefit over 6,000 people. Farmers’ groups were formed in each village where the MIDP had built strong relationships over many years. Selected farmers (15-25 per village) were given training and assistance with farm layout. These farmers first undertook FMNR and CRM on their farms. At least one selected nurseryman from each village was trained in all aspects of tree propagation, planting and care to ensure good quality acacia and other useful trees were produced in each village for planting in the farming systems. Annual crops were planted between tree rows, and all labor was provided by the farmers themselves. Important factors influencing adoption included: 1) a simple, low cost and flexible farm layout. 2) SIM’s long term presence in the region working in agricultural innovation and good relationships and trust in the villages; working through dedicated national staff in the local language and 3) SIM’s promotion efforts, which included bi-weekly follow-up meetings in the villages, farmer field visits, annual tree nursery and farming systems training courses, open field days with demonstrations, weekly radio broadcasts, and the opening of a small market for the acacia seed to promote interest in growing Australian acacia trees. Demonstration FMAFS were also established in 11 villages with adjacent control farms to compare the eco nomic benefits of the system. Figure 3. 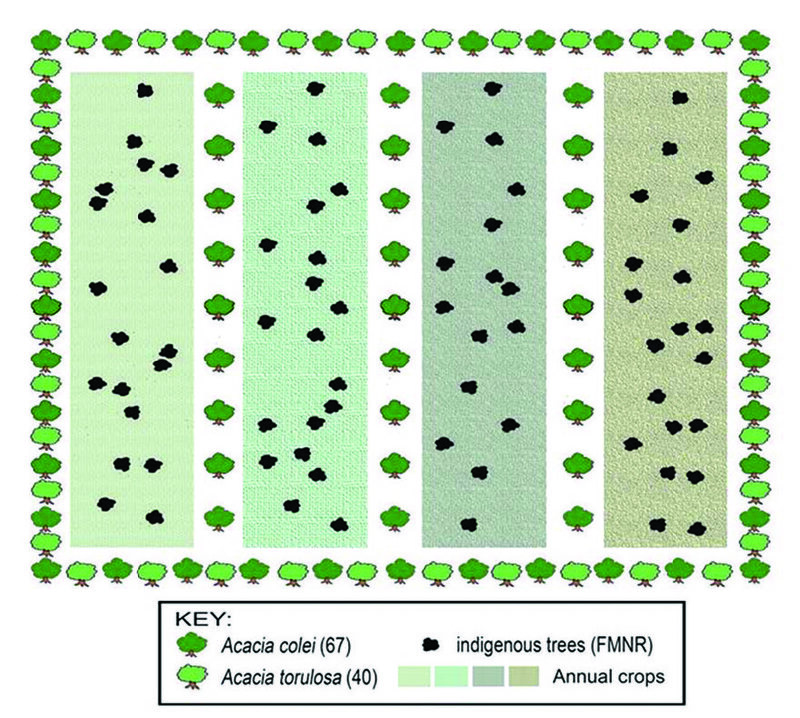 A typical FMAFS showing multi-purpose acacias and annual crops. The FMAFS retains and promotes all the benefits of FMNR: biodiversity is enhanced; a diversity of trees produces firewood, tim ber, fodder for animals, human food, and medicines while restor ing the land through protecting soils from erosion and improving fertility. The Australian acacias are extremely fast growing, fix nitrogen and provide firewood, timber, mulch and nutritious food (21% protein, 50% carbohydrate, 7% fat, with vitamins) for hu mans and animals, while contributing to environmental restora tion and crop protection. The annual crops provide food and income as well as crop residues for animal fodder and CRM. Farmers have the flexibility to spread compost, animal manure, other organic residues or micro-dose mineral fertilizers to their annual cropping areas. Farm labor and income are spread throughout the year which gives resilience to families and helps to buffer against crop loss due to drought or insect attack. Results from our research trials (2007-2009) have shown a two-fold increase in total farm income from FMAFS compared to the national average farm income. The village demonstration FMAFS have been extremely variable, likely reflecting high variability in rainfall but the results show farm incomes (2007-2009) ranging from 68-500% higher with FMAFS than in the adjacent control farms (traditional millet crops). We have also recorded increases in the number of indigenous tree species and at least a three-fold increase in stem numbers (potential trees for income) after just three years of FMAFS. The results of a successful half hectare FMAFS farm are give in Table 1. Note the diversity of income sources, the two-fold increase in crop income and the five-fold increase in total farm income compared to the control (traditional millet crop). There was also a doubling in the numbers of indigenous tree species from three to seven and a six-fold increase in tree stem numbers due to FMNR from 2007-2009. Table 1. Average annual economic benefits from a half hectare FMAFS vs. adjacent half hectare control farm at Magajin Kware over three years (2007-2009). Importantly, FMAFS increase resilience to total crop failure, which occurs on average at least every third year. The range of income sources from the food crops (grain, acacia seed, fruit ), firewood, and animal fodder help to buffer against adverse events such as drought, insect attack or storms. Firewood is becoming increasingly expensive in the Maradi area and even more so in other areas of Niger. We estimate that two to three hectares of well-managed FMAFS will provide adequate firewood for an average family for a year, and will also provide a surplus from food crops for sale and income generation in an average year. Subsistence farmers in the Maradi area have been very resistant to change. Moving to agro-forestry (farming with trees) has taken more than a decade, as farmers traditionally view trees as weeds and competitors with their annual crops. All trees in Niger are owned by the state. Although a tree ownership policy has still not been officially recognized in Niger, for various reasons there is a widespread though false perception held by many farmers that the trees belong to them. This perception has facilitated the widespread adoption of FMNR. In comparison to allowing trees to regenerate from stumps, the planting of new trees and the subsequent care and protec tion of tree seedlings by farmers is generally poorly practiced, leading to poor tree survival. Moreover, direct seeding of the acacias has been unreliable. The Australian acacias, however, have been very successfully introduced via planting from village tree nurseries. Though costly and time consuming, tree nurseries are still the most reliable way of producing seed lings of the acacias and other trees. Once planted, the acacias have a great advantage with rapid establishment and very high growth rates; additionally, they are unpalatable to grazing animals and, thus, can rapidly colonize on farms or degraded land. The current acacia species and provenances have been developed for 350-500 mm rainfall areas. However, with diminishing rainfall associated with climate change, we must now look to more drought tolerant provenances or new species for < 350 mm rainfall areas. Further research on the acacias is also needed to understand and improve seed production. A commercial inoculant for these semi-arid acacias would greatly improve establishment, growth rates and nitrogen fixation. The development and adoption of Australian acacia seeds for human food has also been very slow. Annual purchase of acacia seeds by the project seems to have stimulated interest in growing acacias and even greater consumption of the seed, however more needs to be done to establish viable markets. Ongoing research is helping to identify limiting factors and strategies to build the market and so encourage more widespread planting of acacias and promotion of the FMAFS. The FMAFS is an incremental advance and rides on the success of FMNR. Winning farmers’ trust is crucial. Close working relationships between SIM staff and farmers have been built for over 20 years and this liaison has helped farmers to understand the root causes of crop failure. Ongoing development activities have created a high level of trust. SIM staff members have persevered over many years in the face of misunderstanding, setbacks and even rejection. Regular follow-up to support/facilitate adoption. We follow up with farmer groups at least twice monthly throughout the year; we have found that this degree of regularity in consultation has enabled successful transfer of knowledge. Training occurs at the research and demonstration center and on village farms. Weekly radio programs have helped to reinforce the grass roots teaching and training. Farmer-to-farmer communication was the key to widespread adoption of FMNR and is now having impact with FMAFS. Also important have been farmer exchange visits with motivated farmers to promote dialogue. Opening a small market for acacia seed and wood, in conjunction with promotion, has helped to generate interest in FMAFS. The FMAFS should be seen as an approach or set of principles for sustainable agriculture. Key components include maximizing biodiversity of annual and perennial species, mulching to protect soils, nitrogen fixing plants, crop rotation, animal-plant interactions, spreading risk and labour demand throughout the year. While we have established one and half hectare farm layouts for initial training and promotion, these are not strict blueprints. As with FMNR, FMAFS is flexible with farmers selecting the layout, the tree and annual species and the degree of FMNR with annual crops. It is critical to listen to farmers needs and objectives and to adapt the FMAFS accordingly for particular agro-climatic conditions and the concomitant appropriate species mix. Climate change specialists predict the semi-arid regions of Africa will become warmer and drier with shorter growing seasons and increases in climatic variability (droughts & floods). Annual crop yields are expected to decline by at least 15% by 2030 in the Sahelian region (150-600 mm annual rainfall). Poor subsistence farmers in these regions need to make significant changes, adopting holistic integrated and sustainable farming systems like the FMAFS. Farmers need to recognize that their current farming system is not meeting their needs and be willing to change their traditional farming practices. They need to understand the many benefits of FMAFS and that the extra effort of establishing and care of new trees, doing FMNR, CRM and rotating crops is worthwhile. Farmers need training in FMNR and in tree planting, management, harvesting and processing of Acacia seed. Key farmers with good FMAFS farms provide powerful examples and motivate adoption of FMAFS by other farmers. The extension/change agent plays a vital role in helping people understand their situation and in encouraging them to try new ideas and techniques. Empathy, persistence, skill and flexibility are key attributes. Well-adapted, affordable improved crop varieties and other agro-forestry trees need to be made available from governments, international agencies, or other NGOs. Access to research results and understanding of their imple mentation at the farm level will help adoption of the improved components of the FMAFS. If food security is to be attained, and sustainable farming practices followed in the marginal semi-arid regions, government extension services need to grasp the benefits of new farming systems such as the FMAFS and give credibility to their promotion and adoption. Government agencies also need to have favorable natural resources policies. Farmer ownership of trees and other natural resources is vital to encourage their investment in a new farming system. FMNR, the foundation of the FMAFS, requires the presence of coppicing tree stumps on farmers’ fields and or viable tree seed reserves in the soil. In some areas, tree stumps have been removed for mechanical agriculture; however, in most semi-arid regions of Africa there are many tree species that grow/survive from root stumps. As it begins with what the farmers know (farmers first), the FMAFS is simple, teachable and easily transferable. Farmers are able to manage and have control of trees on their land. Every acacia tree provides multiple benefits such as edible seed for human and/or animal consumption, significant income from wood sales, wood for construction and cooking, protection against wind damage and soil erosion, mulch from tree residues, and nitrogen fixation for improved soil fertility. It is also noteworthy that the acacia foliage is not eaten by livestock. This greatly enhances tree establishment and survival and ensures high biomass production for wood, mulch and windbreaks. Biodiversity is maintained and enhanced, as the trees provide shade and habitat for beneficial animal species. The range and rotation of high-performing annual crops provide food, income and reduce the disease incidence that is often associated with mono-culture and continuous cropping. During periods of food shortage when crop yields are marginal, tree products can be sold to enhance food security. Moreover, crop residues provide increased fodder for animals and, instead of being burned as cooking fuel, can also be used for mulching to reduce water runoff and enhance soil fertility. Importantly, the only cost associated with FMAFS is the farmers’ labor. Labor requirements and income generation are spread throughout the year, and the FMAFS more than doubles farm income. FMNR is now recognized as one of the great success stories in the field of revegetation and agriculture in Africa and is continuing to expand through the Africa Regreening Initative. Farming communities where FMNR can be practiced should be encouraged to try the FMAFS, which is an incremental advance on FMNR and is based on sound research and farm experience. If you try FMAFS in your area, we encourage you to contact ECHO (ECHOcommunity.org) or Peter Cunningham (peter.cunningham@sim.org) to let us know of your results.